The Merry Karnowsky Gallery in LA will be hosting a fundraising event the evening of Oct. 1 to benefit Barack Obama’s presidential campaign. The event will include an art show featuring works by The Clayton Brothers, Camille Rose Garcia, Seonna Hong and others. 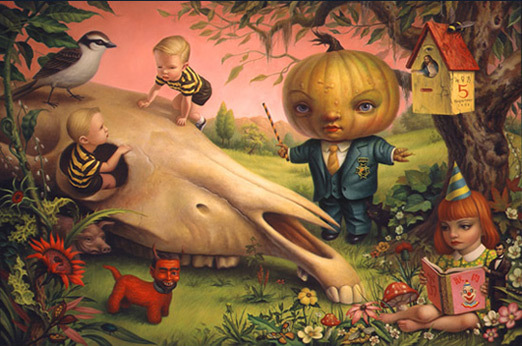 Especially for the benefit, pop surrealist superstar Mark Ryden is producing an exclusive limited edition print, with all proceeds going to the Obama Victory Fund. And for all you who aren’t in LA, you can get the print now, even if you can’t make it to the event. Details after the jump. 2.) Put ‘Mark Ryden’ in the ‘Subject’ field of your email. 3.) Put your full name, email address(s), and best phone number(s) to reach you. (A piece will not be reserved for you without this information). 4.) A gallery representative will then contact you regarding payment/donation details. If you have questions, please call 323.933.4408. Reservations will close on September 30, 2008. Payment/donation must be received by the end of the day October 1, 2008. The Pumpkin President Lithographic Poster will be shipped, or available for pick up in 6 to 8 weeks. discuss this print release here. Categories: Art, Contemporary Art, Low Brow & Pop Surrealism, Shows & Events. Tags: Barack Obama, Camille Rose Garcia, Clayton Brothers, Mark Ryden, Merry Karnowsky, Seonna Hong.